Large Part Heat Treating Experts. 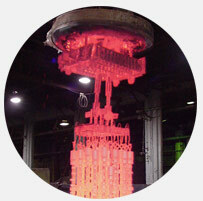 Metlab can heat treat big parts, up to 15 feet in diameter and 22 feet deep and up to 25 Tons! 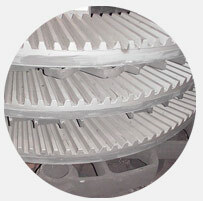 Large Gears, Bearings or other components in Steel, Copper, Aluminum, Nickel, Titanium and Exotic Alloys. Metlab is no ordinary heat treating company. Not only do we offer superior quality and reliability, which is expected from a heat treater, but we also have extraordinary capabilities in terms of size and quantity. Metlab offers a broad range of thermal processing equipment from sealed integral oil quench batch furnaces to pit furnaces up to 15' in diameter and 22' deep. With equipment flexibility and significant heat treating experience, the company provides efficient processing of small to extremely large components and batches of parts. 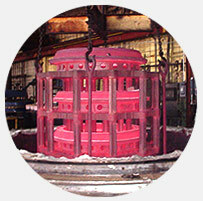 Processes offered include heat treating under air and protective atmosphere, carburizing, nitriding, and other thermal treatments. Boronizing and black oxide are among the protective corrosion and wear protection surface treatments offered. Metlab's unique and extensive equipment base offers customers the broadest available heat treating, surface treatment and size capability. As a result, customer designs are free from heat treating size constraints common in the industry.